We may still be a few months out from proper rosé season, but that doesn't mean we're any less ready for it to arrive. There really is no substitute for a chilled glass of pink wine on a hot day. Or is there? And is it actually a big ol' glass of pink vodka? That's a question you'll be forced to ask yourself from now on, now that there's a rosé-flavored vodka on the market. 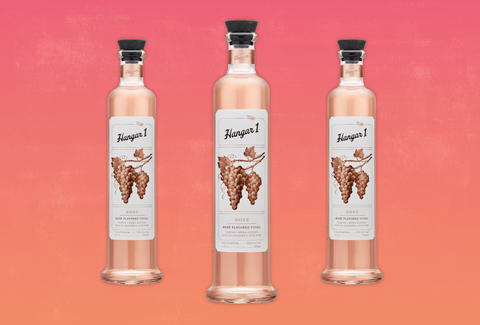 This spectacular development in the rosé-verse comes courtesy of Hangar 1 Vodka, a distillery in Napa that turns out a handful of small-batch craft vodkas, including one regular and three other flavored varieties: Mandarin Blossom, Buddha's Hand Citron, and Mikrut Lime. They also produce a few interesting seasonal "Distiller's Exclusive" bottles, including a chipotle, pink peppercorn, and honeycomb vodka. The new rosé flavor isn't just some novelty pink-colored hooch that tastes like garbage. It's actually a blend of Hangar 1 vodka and real California rosé, meaning its flavor is authentic, though certainly a bit sharper than a regular wine on account of it, ya' know, being vodka. As for alcohol content, it clocks in at 60 proof (30% ABV), meaning it's more than twice as boozy as your typical bottle of rosé, though slightly less than standard vodka. Hangar 1 suggests enjoying it straight over ice, as a spritzer, or in a sangria. And as tempted as you may be to stand by your "rosé all day" mantra, it takes on a much different meaning when you're dealing with vodka... all day. You can currently pick up a bottle online for $32 right here, and there's also a handy map of where it may be available in your area.